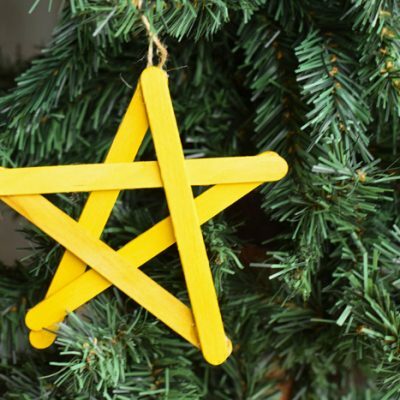 Tis the season to get crafty! It’s also the season to give. Why not combine the two with a fun Crafter’s Bundle Giveaway! And, if that’s not enough, I’ve also included the links to 21 other awesome giveaways at the bottom of this post! 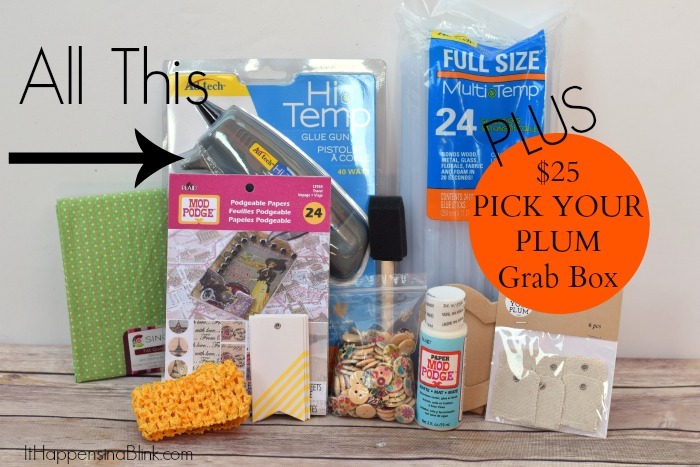 This Crafter’s Prize Pack Giveaway includes a $25 Pick Your Plum Goody Box, a new full size Adtech Glue Gun and Glue Sticks, and crafty items from my stash! 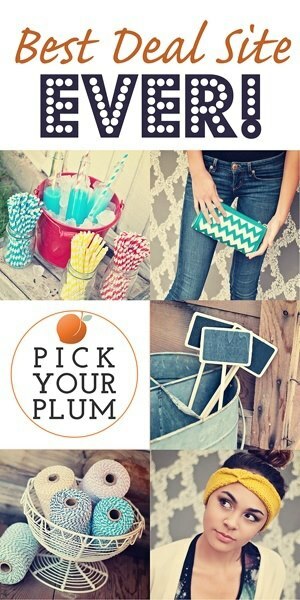 Have you ever heard of (aff link) Pick Your Plum? They are a great daily deal site that offers trendy items at discounted prices. 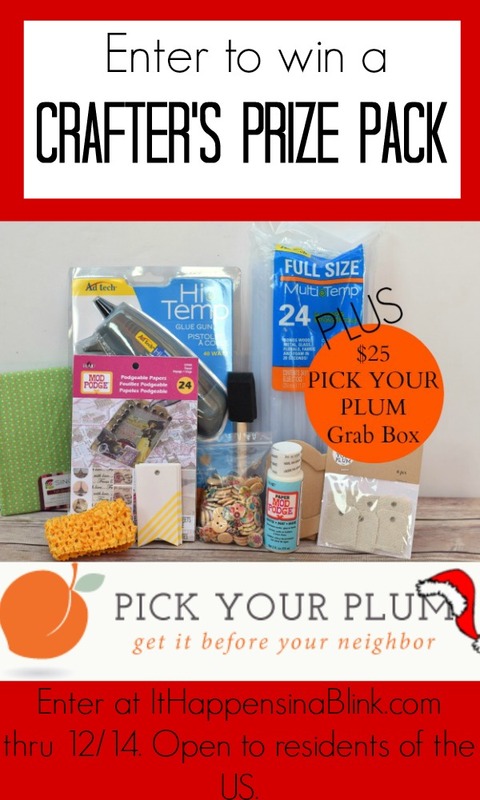 Pick Your Plum (aff link) is offering a $25 packed box of goodies as part of this giveaway today! Oh my goodness just look at all goodies that COULD come in your box. Disclaimer ~ items pictured above are not guaranteed to be in your box. Pick Your Plum is responsible for the fulfillment of their portion of the prize. Read to enter? Use the below Rafflecopter form! This giveaway is open to residents of the US. This giveaway is not associated with Twitter, Facebook, or Pinterest. 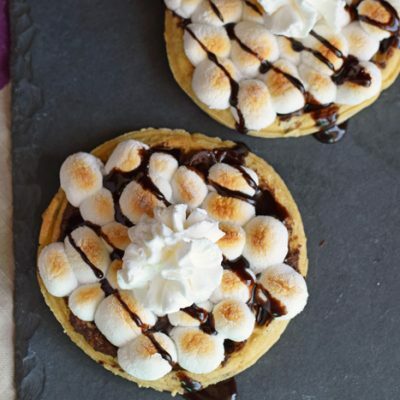 This giveaway is sponsored by Pick Your Plum and ItHappensinaBlink.com. This giveaway is open thru 12/14/14. Only valid entries accepted. Want more giveaways? Enter to win other great prize packs below! 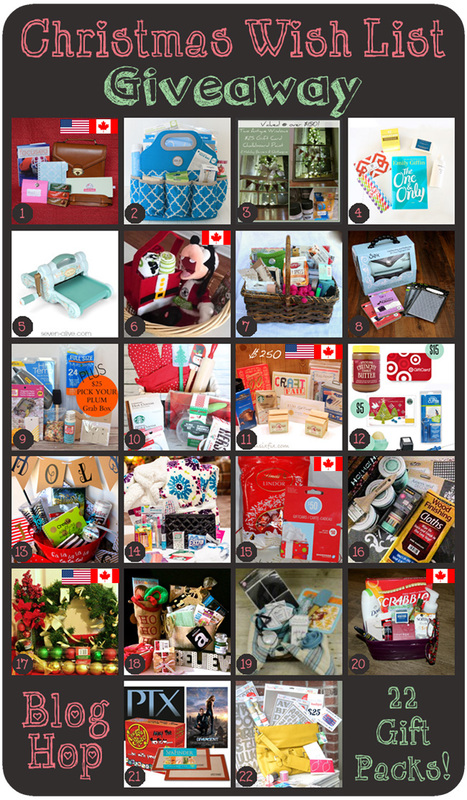 22 amazing bloggers from 2 countries have gotten together to offer 22 prize packages for this year’s Christmas Wish List Giveaway! Each blogger has gathered some of their favorite items from their own wish list and put together a gift for you! Visit each blog to see what items are included in their prize. Every blogger has a separate giveaway that you must enter on their own site, to win their prize package. You might win more than one! Giveaways open to Canada will have a little Canadian flag in the top corner of their image (above). If there is also an American flag that means that giveaway is open to both countries. Most of the giveaways are open to the U.S. only (no flag on image). hmm… my glue gun gets a lot of use! My favorite crafting tools are Mod Podge and my acrylic paints!! My favorite crafting tool is my crochet hook! I have an Accuquilt maybe that and my rotary cutter. My favorite would be a hot glue gun but I don’t have one of my own yet. My favorite crafting tool is my own imagination the skies the limit. My favorite crafting tool is paint brushes! I love Modge Podge and with all of the different formulas I use a lot of it. My favorite crafting tool is my Big Shot. I don’t know what I did before I had it! What a great giveaway!! Just checking out your blog for the first time! ( fairly new to the blogging world)! I think yours is just terrific!! Must subscribe!! Happy Holidays!! My fave crafting tool is glitter! 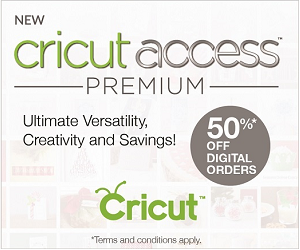 I’m hoping it will be the cricut explore I just bought. My favorite is scissors. Thanks for the giveaway. right now it has to be my new clover crochet hooks….but it changes often!!! I would say my favorite is a hot glue gun since it is so universal. I hope to expand my crafting though. A good pair of scissors! A sharp pair of great left handed scissors. I think you have to start with the basics and that is a basic as you can get. My favorite crafting tools is my hands! ;D Those count as tools right? Haha. Wow! I would love to get this gift basket in the mail. So many crafty possibilities! I’ve barely used it, but so far my favorite tool is my Cameo! I know that it has a lot of capabilities. I just need to explore them already! Oooooooooooooooooooooo I’d love to win this for my new sewing/crafty room!!! I could sure use a new glue gun! Thanks so much for this awesome giveaway! My favorite crafting tool has got to be a glue gun,I don’t know what i would do without it! My favorite crafting tool is my sewing machine. My acrylic paints are my favorite tool….or would it be paintbrushes? About the giveaway, those buttons are adorable! Where did you get them? Great give away, thank you. I guess my round nose pliers are my favorite crafting tool. 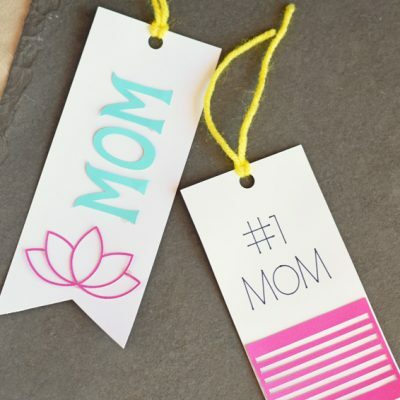 It’s not just for jewelry, it can be utilized in many different craft projects. Imagine how much time we wasted waiting for glue to dry years ago! I could not live without my glue gun but I would love to replace my old mini with a new full size. I love all the tools in my craft room; however, I just got a Silhouette Cameo, so that has to be my favorite, hands down. The glue gun is my favorite craft tool. I use it all the time! mod podge!!!! anything! i could decoupage anything!!! Oh I am just starting to try to get back into my crafting! I loved my glue gun, but have not been able to find it. This prize package would give me lots of fun ideas to get started again! I love my sewing machine! My favorite tool is my glue gun and some nice stencils. The silhouette is my favorite crafting tool! What a great gift set! Thank you for a chance to win! My favorite crafting tool(s) are my jewelry pliers. Have a Merry Christmas! I got to say, Nothing beats a good set of markers and sharp scissors!! I love felt. so many choices to make things with it! My fave tools are my silhouette and my knitting needles. My favorite crafting tool is my die cut machine. I love my glue gun. Its old and ugly but works great. My other favorite tool is the internet. I can look for projects for hours. hahaha my favorite crafting tool is my hot glue gun! Hi! The Christmas Giveaway brought me to your site. 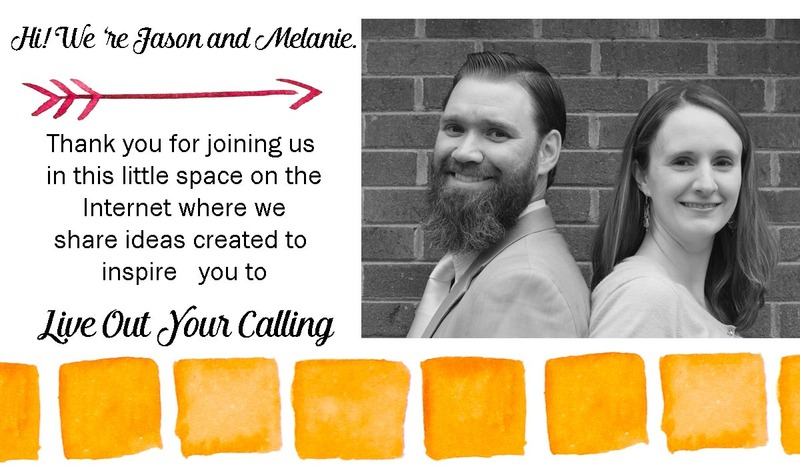 Looking forward to your future blogs! Xyron sticker machines are my favorite. I have 3 different sizes and use them all when I make scrapbooks. I am currently working on a 90th birthday scrapbook for my friend’s father. He turned 90 last month and we had a BIG party for him with tons of pictures. I hope to have it finished in time for her to give it to him for Christmas. Thanks for being part of this fun hop and for the chance to win. My favorite is double sided adhesive. I’d say decorative paper or glitter! My favorite crafting tool is my little hot glue gun. My crochet hooks for sure! I’d be lost without a glue gun! And my little cutter bee scissors. My favorite tool is the paper tweezers. Especially love them using tiny scraps of paper. I love to use my sewing machine to craft and make things for others! 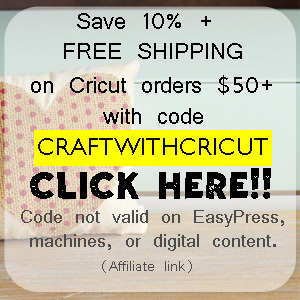 My favorite crafting tool is my rotary cutter! My favorite crafting tool is a rug hook. I love to use my rotary cutter. It makes projects so much easier. my favorite crafting tool(s) are my metal jewelry stamps. I love creating with them! My mom’s Cricut…hopefully I’ll have my own some day!